The cool sophistication of 'Ice', taken from the ‘Redline 7000’ series of 1988–89, revels in the graphic intensity of film-noir visuals. The striking portrait of a young, beautiful woman (Stacey’s protagonist, Ice) dominates a backdrop filled with illuminated buildings, with sweeping lights cutting through the shadows and night skies of ‘a city that never sleeps’. Constructed from a montage of high-key black-and-white images with applied hand-colouring, Stacey draws on the stylistic elements of the genre to create this dramatic scene. 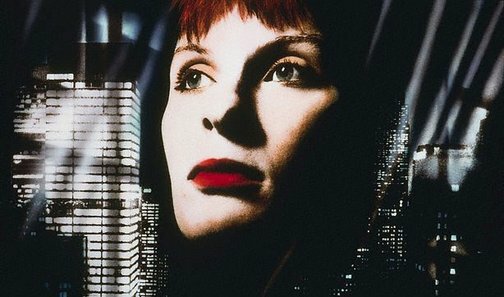 Loaded with ambiguity, from the non-specific urban location to Ice’s enigmatic expression, the potential for duality in character and circumstance adds mystery and insinuates a narrative, just as the early movie posters of the period were devised to arouse audience interest: is she a victim or a cool vixen? Are the beams in the night sky search lights or Hollywood footlights? Despite Stacey’s preoccupation with a film genre situated in the past, the work is defiantly more than reverie and nostalgia. The richness of Cibachrome face-mounted onto plexiglass produces a slick, futuristic film finish. Stacey’s interest in film-noir is not simply to replicate its stylistic concerns, but rather to investigate the motivations and content which underpin it. These include its tough, cynical characters, often dominant females (‘you remember the power of the woman long after you remember the ending of the film’) and bleak urban settings that reveal the underbelly of American idealism.2 Recognising a currency and relevance to her own times, Stacey pursued the theme of urban decay with greater directness in subsequent work, for example ‘All the sounds of fear’ 1990. George Alexander, Photography: Art Gallery of New South Wales Collection , 'Tableaux - memento mori - screen culture', pg.313-335, Sydney, 2007, 317, 330 (colour illus.). Anthony Bond and Victoria Lynn, AGNSW Collections , 'Contemporary Practice - Here, There, Everywhere ...', pg. 229-285, Sydney, 1994, 272 (colour illus.). Peter Emmett, Sydney: metropolis, suburb, harbour , 'Metropolis', pg. 13-70, Glebe, 2000, 15, 16 (colour illus.). Michele Helmrich, Return to sender , 'Return to sender: the exhibition/ the artists/ the state of Queensland', pg.27-59, Brisbane, 2012, 41, 82 (colour illus.). Geraldine O'Brien, The Sydney Morning Herald , 'The myraid faces of Sydney', Sydney, 20 Dec 1999, 12 (illus.). Review: works by women from the permanent collection of the Art Gallery of New South Wales , Women in the Contemporary Collection, Sydney, 1995, 15, 26, 16 (illus.). Critic's Choice , Sydney, 1994, 11. Twenty contemporary Australian photographers - from the Hallmark Cards Australian Photographic Collection , Melbourne, 1990, 47 (illus. ).